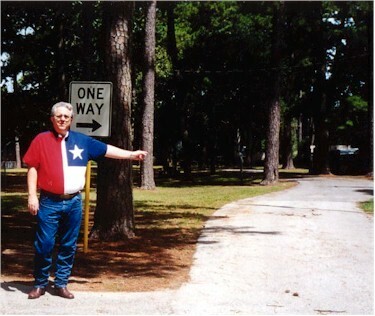 Sam Houston's Dilemma "The Fork in the Road "
"The Sword of San Jacinto"
On April 15th 1836, the Texas army with a slew of settlers on the run from the Mexican army were camped at the McCarley home site located on Spring Creek in current day northwest Harris County. There was a lot of grumbling in the camp because everyone knew that the next day the army and its' entourage would be coming to a fork in the road, to the left, the road to Nacogdoches and beyond the safety of the United States, on the east side of the Sabine river, to the right, Santa Anna and the Mexican army. 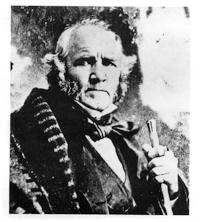 General Sam Houston, Commander and Chief of the Texas Army, was never one to hold council with his officers. He had kept his plans to himself. Most of the Army was tired of running from Santa Anna and the Mexican army and had discussed open rebellion against General Houston if he attempted to take the "left" fork in the road to safety. The settlers on the other hand were traveling with the army for safety, both from the Mexican army and hostile Indians. They wanted to run for the safety of the Sabine and they wanted the Texas army with them for protection. The next day, April 16th 1836 as they broke camp it was pouring down rain. The rag tag Texas army and settlers made way toward the settlement of New Kentucky and the fork in the road. As they approached the Abram Roberts place, located at the juncture of the two roads, Abram Roberts was standing on his gate. The solders shouted, "Which way to Harrisburg?" Abram Roberts pointed to the southeast. Sam led his troops toward Harrisburg. A big cheer rang out from the Army, a groan from the settlers. They were depending on the army for protection, not just from the Mexican army, but also marauding Indians. Sam allowed a few solders to continue on with the settlers. Many solders went on with the settlers because they were tired of "playing army. In all about 300 solders headed toward Nacogdoches and safety. Sam Houston and the 1100 soldiers left headed toward Harrisburg. The New Kentucky Park has a historical marker commemorating the decision of the "Fork in the Road". The park is located on FM 2920, a few miles west of Tomball.